Note: This post may contain affiliate links. For full information, see here for full disclosure. 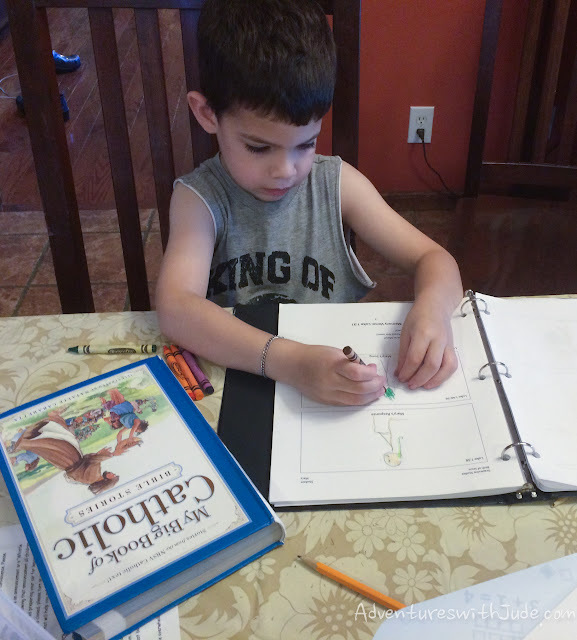 Bible instruction is important to me, but Bible studies for young children can sometimes be difficult. We've tried a few Bible study programs in the past, but they've not been a good fit for us. One was better suited to a group setting, and one was just too much memorizing for Jude to be able to handle. 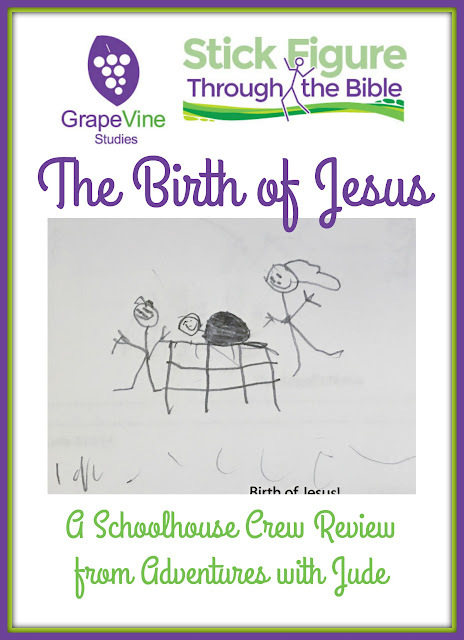 When the Crew gave us the opportunity to try Grapevine Studies' program, we decided to try a different perspective. Rather than starting "In the beginning..." with Genesis, we decided that fall was a good time to begin studying the story of the Nativity instead. 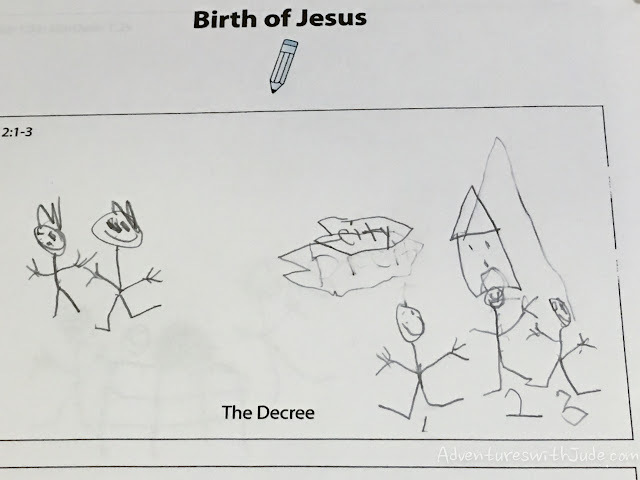 For the last few weeks, we've been "stick-figuring though the Bible" with The Birth of Jesus (Beginner Level). Jude has been working with the drawing his own pictures with the Beginner eBook, while Damien has been working with the Traceable for Beginner eBook. I like that Grapevine Studies is adaptable for all faith traditions. It does not focus on a single interpretation of the Bible, but instead employs a framework of chapters and verses that allows the parent/teacher to choose the translation to be used. 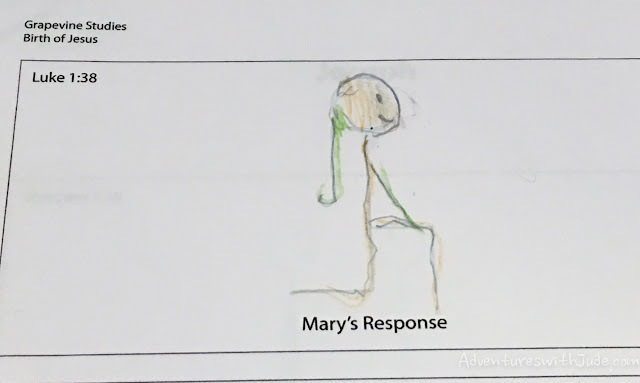 I think this makes the program as unique as its stick-figure approach. I've found that most Bible studies that I have looked at rely on the King James Version of the Bible. There are differences in the translations, and while many would say "Isn't the Bible the Bible? Does it matter?" I would answer that yes, it does matter. 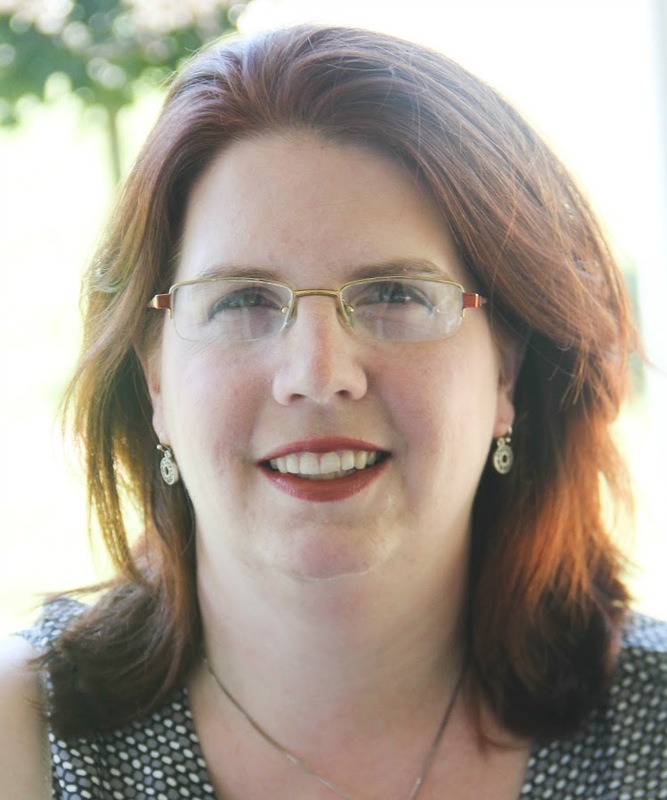 On a practical level, I want to use the Bible I already have and that the boys' catechism studies use, but on a theological level, there are differences and I want to use the translation (NRSV) that my Catholic faith uses. Have you ever considered at a program that outlines the ages that it's for, and then when you get it find yourself saying, "What? There is no way this is appropriate for this age!" Sometimes, it's too easy, but often in my experience, curricula tends to run "ahead." Programs are labeled for a specific grade, but often the average student for that grade will probably have a struggle with it. Grapevine's program really is doable for the intended student age range. The Beginner level is for ages 5 through 7, or students on a K-2 grade level. 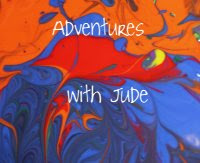 Jude's abilities are about at a first grade level, and he had no trouble with this level. 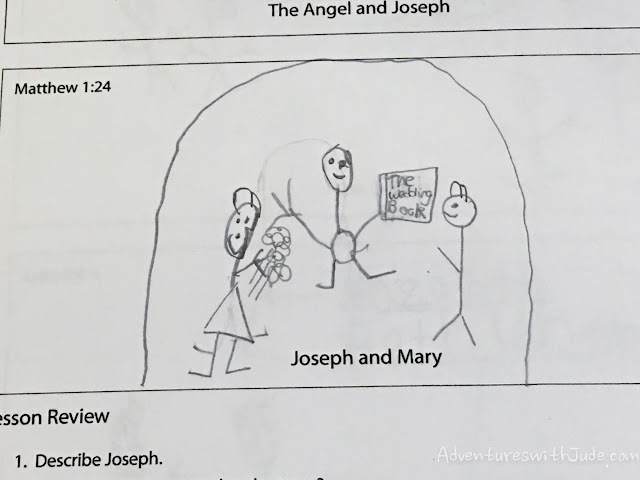 While one could argue "the Nativity story itself isn't that difficult," study guides can sometimes complicate things. 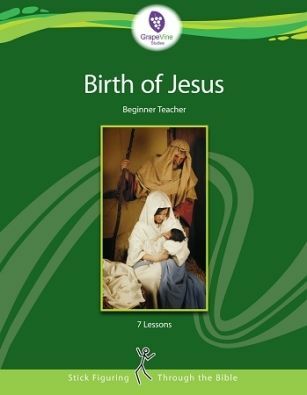 This guide breaks the story of the Nativity down into manageable chunks, and the review questions are simply worded. This curriculum did not overwhelm Jude at all. He became excited to hear the next day's reading, because it gave him small bits at a time - enough to keep him interested, but not so much that it became a dreaded subject. Learning about God should never be a chore! The curriculum also divided the story by "characters in order of appearance." 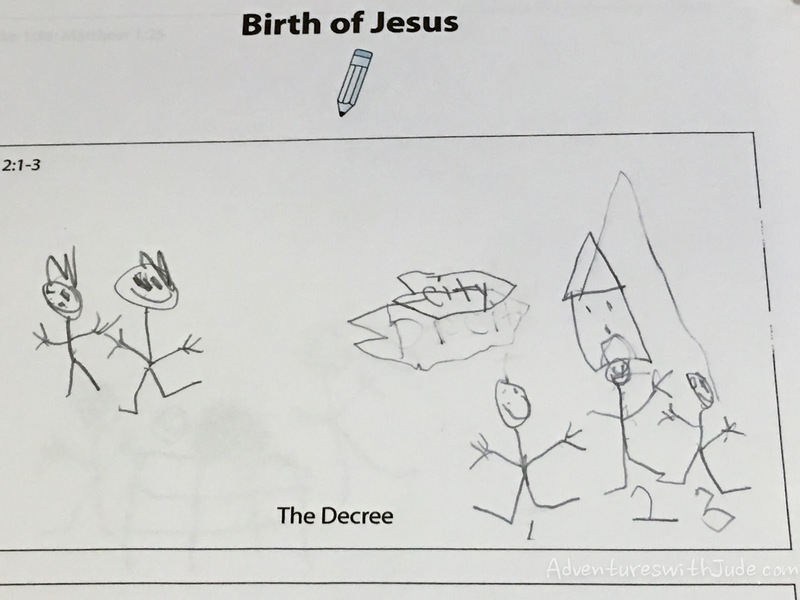 This really helped explain the Nativity story because we're focused on one person at a time and his or her role in the Nativity. This curriculum can be worked on one "person" at a time, or one mini-story at a time. There are 7 (weekly) lessons that can officially be broken down into fourteen daily lessons. However, we opted to got at an even slower daily pace. We opted to do one person over the course of a week, so that we were able to break down the story into very small groups of verses to reflect on. We would read the verses listed in the corner of an illustration box, Jude would draw a picture to help him visualize the story, and then I would dictate the verse(s) for him to write into a notebook. I think Jude could easily have handled a semi-weekly schedule, but we went at a slower rate because of Damien. The Traceable for Beginner level is geared to ages 3-6 who many not have the motor skills to draw figures but are able to trace over lines. It coordinates with the "blank" Beginner level that Jude used, and allowed Damien to be part of our study. 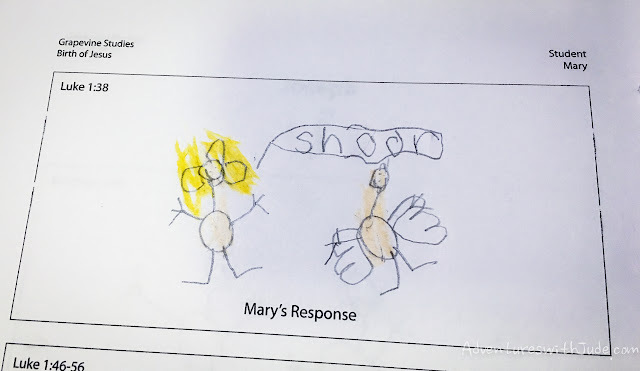 Because he's only 5, he doesn't really have the concrete thinking to be able to listen and then draw what he heard. Having a picture already present gave him visual clues as he listened, helping him understand what he heard. However, because he still had the the extra tactile sensory input from drawing the picture by tracing it, it helped reinforce the story. 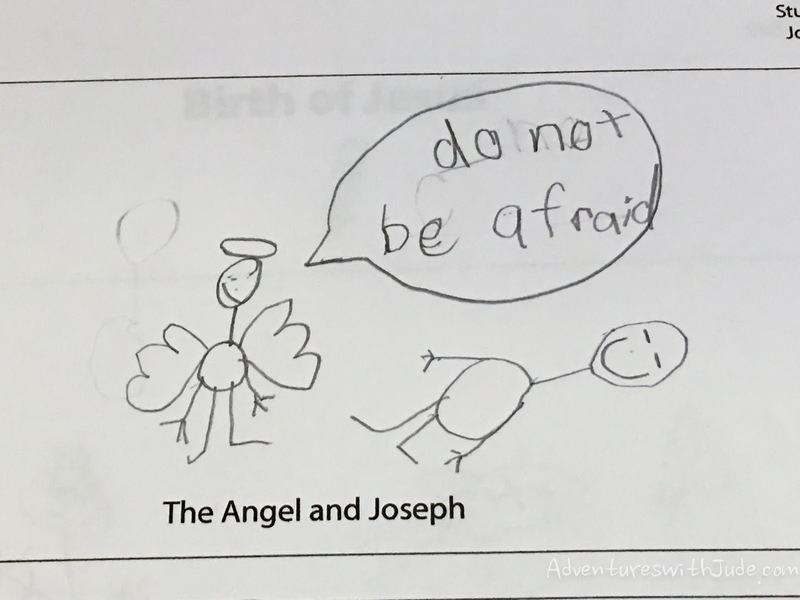 We also received a Teacher's Book that includes lesson notes/goals/key points, example stick figure drawings, the memory verses, and answers to review questions. One of the lesson plan directions is for the teacher to model the story with stick figure drawings. I did not do this, because I know Jude has a tendency to want to just copy what he sees. Instead, I used the drawings to help me guide his thinking if he got stuck. I really wanted to see how he interpreted the stories he heard. I was really impressed by some of his drawings. Although some of his figures were a bit unpolished, I was really happy to see his level of comprehension. So much for Mary's eloquent, "I am the handmaid of the Lord..." God doesn't need us to stand on ceremony; a cheerful "Shoor" (sic) works as an agreement to His plan. 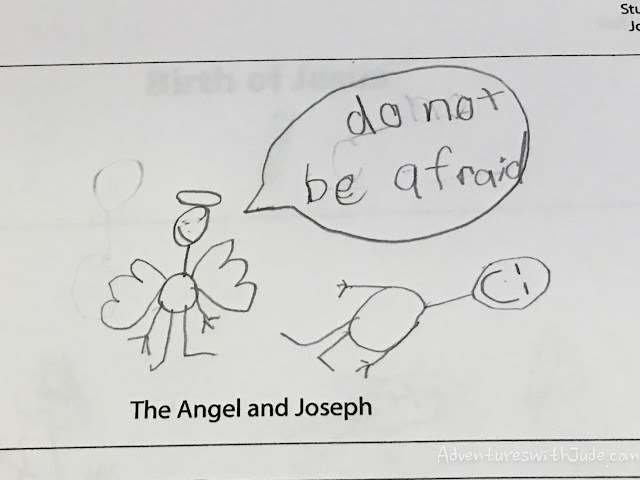 Jude explained this one to me: St. Joseph has a smile even though he's sleeping because the angel helped him decide what to do. In this scene, the "official" picture is a man holding a scroll, presumably with the King's edict. Jude's interpretation was to show people going and being counted. I think he's clearly grasped the content of the Decree, and is more likely to remember this passage because this is what he naturally associated with the text. Some of his pictures had me laughing. In this one, he was insistent that Mary have flowers -- because all girls have flowers when they get married -- and the "guy in the middle needed that wedding book." Here, he asked me, "Does she look round enough to be having a baby?" I think so. Mary even looks ready to topple over...not much unlike I did when I was at the end of pregnancy. There is no writing "required" with the program. Although there are discussion questions at the end of each section, they can be completed orally. Jude wrote answers to them because I wanted him to have an opportunity to work on both his penmanship and writing sentences. 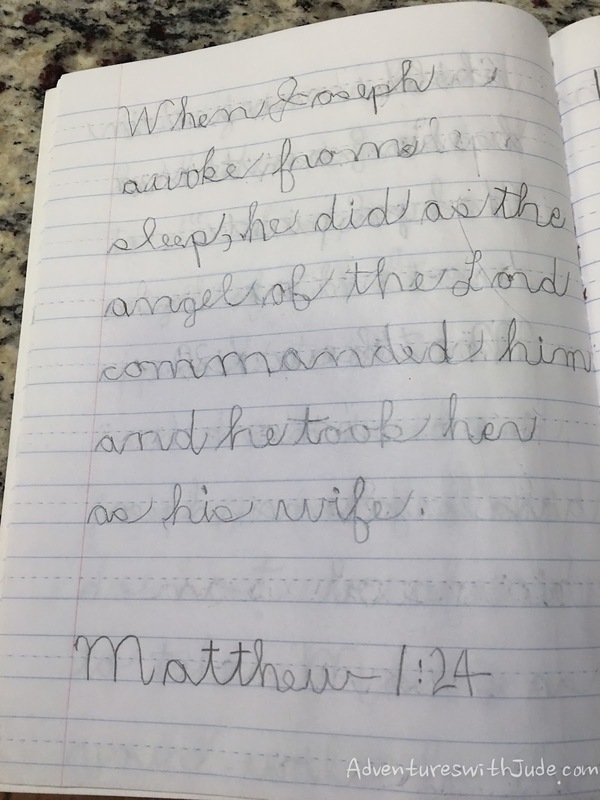 Jude isn't so great at memorizing things just yet, so instead of trying to memorize a weekly Bible verse, he wrote the verse(s) that went with each day's lesson. 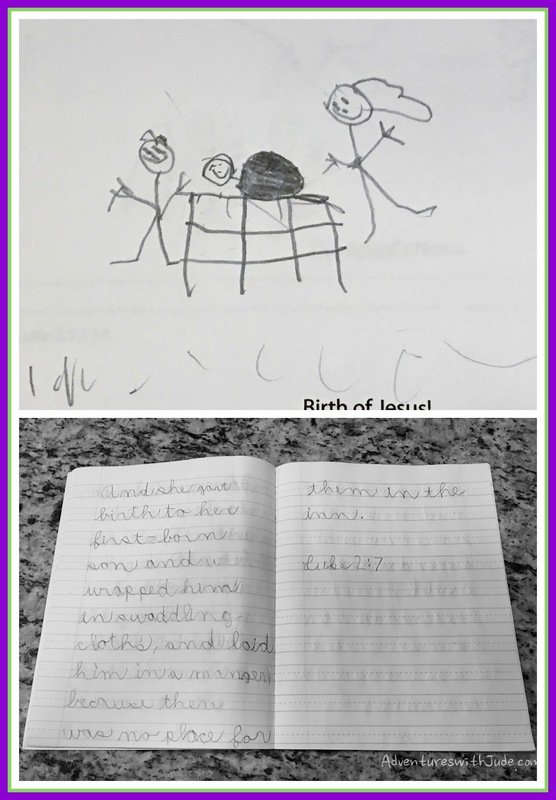 I think the Beginner level was actually a little easier for him than I expected it to be, so adding dictation/penmanship to the activity was a good way to challenge him. We really are enjoying this study! It has been a really good way to formally introduce the true Christmas story, without it feeling overwhelming for either of them. It's easily adaptable for different abilities, even within the "recommended" K-2 grade level, making it a good option for families with multiple young students. (Note: It is a simplified version of their elementary Birth of Jesus program, and not inherently compatible with the multi-level program.) I think Grapevine Studies has become our new favorite Bible study program!